Introduction: In the face of high caloric intake and low levels of physical exertion, obesity induces sympathetic nervous system activation. This increased autonomic activity is manifested as higher blood pressure in obese patients, and as a result, excess body weight is associated with increased cardiovascular morbidity. Furthermore, it has been shown that when patients lose weight, their blood pressure falls, and this is believed to result from a decrement in sympathetic nervous system activation that can be induced by weight loss. However, it is not known if the reduction in weight diminishes sympathetic nervous system responsiveness when subjects are being stressed. We hypothesized that weight loss not only reduces blood pressure at rest, but also, there is a concomitant reduction in autonomic responsiveness to stress. Methods: We recruited 31 subjects with a body mass index over 35 kg/m2 who were awaiting weight loss surgery and 7 subjects who had received bariatric surgery and were at least one year out from surgery. We measured hemodynamics in these patients while they were resting, and again after inducing stress with two experimental paradigms. The orthostatic challenge test and cold pressor tests are two safe, commonly used, non-invasive assessments of sympathetic nervous system reactivity. In the cold pressor test, resting patients are seated and asked to place their hand in ice-cold water for one minute. It has been shown that patients with exaggerated hemodynamic responsiveness to the discomfort of cold water immersion are more likely to develop high blood pressure and other risk factors associated with cardiovascular morbidity. Similarly, it has been shown that individuals who are genetically predisposed to develop cardiovascular risk factors such as hypertension have greater sympathetic responses to orthostatic stress. In the orthostatic stress test, patients are asked to stand suddenly after lying comfortably supine and changes in hemodynamic variables are recorded. Results: As expected, patients with a history of morbid obesity who underwent weight loss surgery had significantly lower systolic blood pressure and mean arterial pressure when compared to obese subjects awaiting surgery. Most importantly, these reductions in resting blood pressures were maintained in post-operative patients when they were stressed with either an orthostatic challenge or the cold pressor test (* denotes p < 0.05 when comparing pre- and post-surgery values). Conclusions: Surgically-induced weight loss not only reduces cardiovascular risk factors such as elevated blood pressure in patients while they are at rest, but also, during maneuvers designed to induce significant stress and reflex autonomic reactivity. 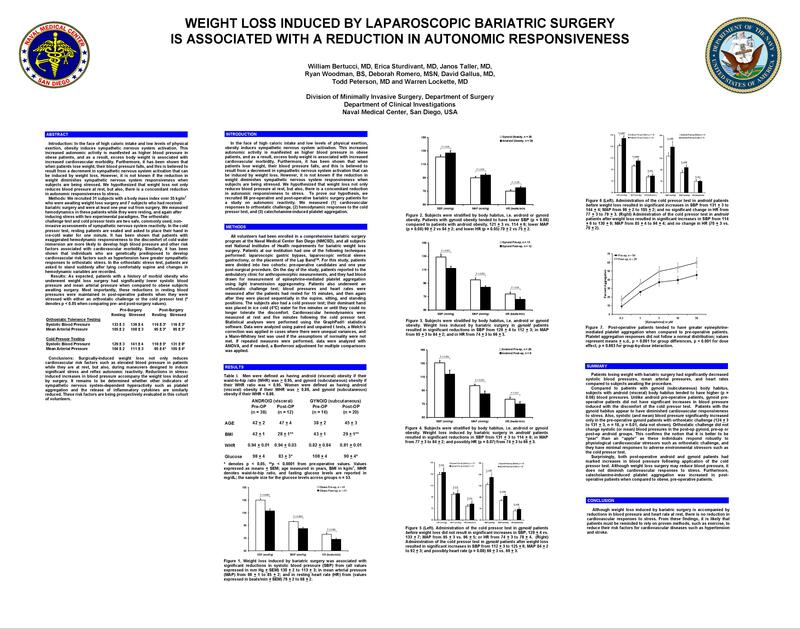 Reductions in stress-induced increases in blood pressure accompany the weight loss induced by surgery. It remains to be determined whether other indicators of sympathetic nervous system-dependent hyperactivity such as platelet aggregation and the release of inflammatory cytokines are similarly reduced. These risk factors are being prospectively evaluated in this cohort of volunteers.